This month at the Melbourne Alt.Net usergroup, Simon Cuce did a talk on DSLs and how they are useful for the average developer. He then went on to show MGrammer from Microsoft which is a tool used to create DSLs. It was an interesting talk, I never saw the value in creating a whole new language just for yourself. But how Simon explained it finally made me realise how they could be useful. The entire talk was 2 hours, I was only able to record the first 1 hour & 20 minutes of it. I missed out the final section where he shows the DSL he created in a browser, but the first part of it is good to see why DSLs are useful and the first steps and questions you should take when creating a DSL for yourself. Melbourne Alt.net June 2010 – DSLs and MGrammer 1of2 from David Burela on Vimeo. Melbourne Alt.net June 2010 – DSLs and MGrammer 2of2 from David Burela on Vimeo. I spent the last 3 days at the “Windows Phone 7 applications camp” run by Microsoft Bizspark Australia http://blogs.msdn.com/b/bizspark_au/archive/2010/05/26/upcoming-bizspark-camps-in-sydney-amp-melbourne-win-7-amp-phone-7.aspx. It was a great event and was run well by the organisers. On Friday David Glover and Nick Randolph helped everyone get the tools installed on their own laptops, then let everybody run through the Windows Phone 7 training kit. Saturday & Sunday were spent with the participants building concept applications that utilise Windows Phone 7. Finally on Sunday afternoon, the applications were shown to a panel of judges. I was ok with showing my application publically as I wanted to get feedback on the idea, and I was able to record it. Unfortunately the other participants wanted to show their applications privately to the judges so I am unable to comment on what they built and was unable to record their presentations. 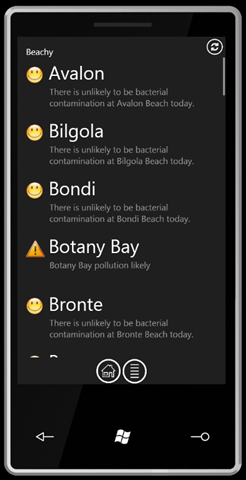 Beachy is an application that advises Sydney residents if it is safe to swim at their local beaches. 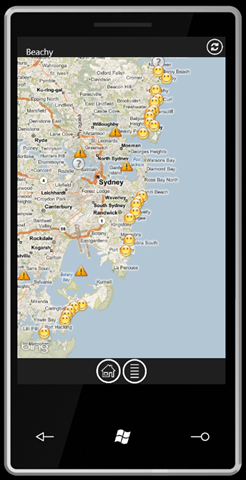 I geocoded 43 beaches around the greater Sydney area, I then bring in data from 6 separate XML feeds from the NSW government that report on dangers at the beaches. All of it is then shown on a Bing maps overlay. 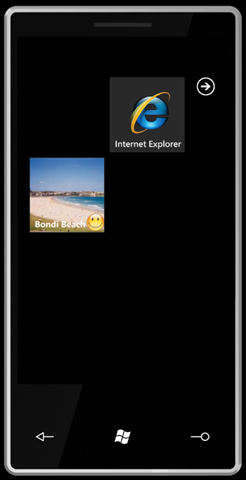 GPS in the phone allows the application to show the user where they currently are allowing them to see if the beaches around them are safe to go to. 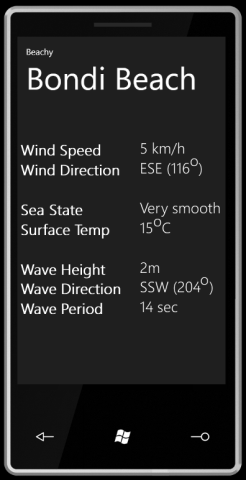 Detailed information about each beach would also be available to the user such as wind speed/direction and wave height. This would allow recreational users such as surfers or people sailing to decide which beach would have the optimal conditions for them. I decided to upload my presentation because I go into detail for the reasoning behind my UI decisions such as button placement and colour schemes. I thought that this might be useful for anyone else trying to make Windows Phone 7 applications. I also left in the feedback from the judges as they had some good advice. Beachy – Runner up at Bizspark camp from David Burela on Vimeo. The next lightning talk from the Melbourne cloud camp is now available. This time it is Clayton from salesforce. Melbourne cloudcamp 2010 – Lightning talk (Salesforce) from David Burela on Vimeo. I helped organise the the cloudcamp that was hosted in Melbourne on April 1st. There was a good turn out and I was able to record a few of the sessions. Melbourne cloudcamp 2010 – Lightning talk (VMWare & EMC) from David Burela on Vimeo. Cloud computing has been getting a lot of attention lately, but what does it really mean and how does it effect you and your business? In this session David Burela will explain the fundamentals and building blocks of cloud computing and how they can be used to build scalable web applications. David will demonstrate how to develop with the Windows Azure platform and easily deploy your applications into the cloud. What is windows Azure, how does it compare against Amazon and Google’s offerings? Bio: David Burela is a Tasmanian who went to the University of Tasmania and worked for “Federal hotels and resorts” for many years as a Graduate Analyst Programmer. Since leaving Tasmania he has worked for Readify as a Senior Devloper and now at Hazaa as a Senior Consultant. He won the international Microsoft programming competition, the ‘Imagine Cup’, with software project SOAK which aimed to assist farmers manage their farms through a cloud computing platform. Now David focuses on ways that Silverlight, Windows phone 7 series and Windows Azure can all be used in unison. There are currently 4 data centres you can send your drives to for the Import/Export: Seattle, Virginia, Dublin and Ireland. This is good, because as Ted Steven reminds us, “The internet isn’t like a truck. It is a series of tubes, and those tubes can be blocked”. TechEd North America just wrapped up this week, so I have taken the time to pull together all of the Azure related topics into one area. As usual each of the sessions are available as streaming video through silverlight, but are also able to be downloaded in low and high qualities. Most sessions also have the slides available for download. So go ahead, download some of the sessions, then sit on your couch and watch them while you relax. Happy learning!